I had a friend describe this weekend’s service as intense. I think that’s a good description of the entire weekend: intense. This was the weekend of “Unwrap the Bible” with Women of Faith. I heard Beth Moore, Lisa Harper, Priscilla Shirer, Shelia Walsh & Christine Caine speak and worshiped with Kari Jobe leading. Intense would describe any one of these ladies individually. Pack them all together and the intensity is multiplied. God truly spoke this weekend. And, honestly, I’m worn out. I’m still processing all that I’ve heard over the past few days. In all honesty, the first time I felt the need to run away and hide instead of being encouraged to move forward was after an Arts Conference. I get included under the flag “artist” because of my singing. And I can sing and harmonize pretty well. It comes easily to me. But, I have NEVER considered myself an artist. My husband was an artist. He could write skits & plays. When he was on stage, I would forget it was Terry and be transported into the moment he was creating thru his acting. I sit in amazement and awe and friends that can just create music. They can write and transpose and mash songs together and make beautiful music. That’s being an artist. An artist creates. I only copy whats already been written. I recreate. I’m a musician and a singer. I have learned to nod my head and not to argue about the term artist, but it’s not a word I use for self-description. At this particular conference, they showed a video of Bill Hybels talking about artists. And he talked about how grateful he was for the artists in his church. And then he went on to talk about himself as a non-artistic person that works well with numbers and logic and planning. Any one that has been around me, knows that I’m a numbers person. I am a linear thinker. I work well with numbers and problem solving is like a game to me. I don’t know that I’ve ever admitted this. But, from that point forward, I’ve questioned where I should be serving. A few years later, I attended a Beth Moore simulcast conference at my church. Travis Cottrell was leading the worship in music. He began to talk about the different types of music and different issues that churches have with the musical style that we use. I can’t remember the exact words. But, I do remember going home that afternoon and emailing my music minister that I was going to take a break from the Praise Team at our church. There were a lot of things going on in my life at the time. My kids were super active in school and there never seemed to be enough time to do everything. I was having to choose between our weekly rehearsal or attending my kids football, volleyball, basketball, wrestling or track events. Anytime I missed one of my kids events, I felt guilty. And I began to resent practicing during the week, to only seemingly rework everything on Sunday morning. Our music minister was very kind and encouraged me to sing even if I missed rehearsals and I did that for a while. But, I didn’t feel it was fair to the others in the group to just show up on Sunday mornings. So, I said I was taking a break. But in reality, I was quitting and walking away. It would be five years before I ventured back into leading worship. This weekend was great. The speakers were inspirational, the music spoke to my heart as only music can. I tried to turn off my analysis of everything and just be in the moment. We were encouraged to believe that our God is a God of miracles. Nothing can stand in His way. We can do ALL things thru His strength and power. We are to stand in His abundance and strength, not stay bent over in our insecurities and fear. It all sounds so right. And then I walk out of the door and back into life, and those little voices start in on me once again. “How do you dare to stand up and try to lead others in worship?” “Who do you think you are? You’re too old and not nearly cute enough to stand in front of people.” “There are others that can do it so much better than you. They just haven’t found them yet.” “Nobody really loves you. They’re just being nice.” And, I struggle against the urge to throw in the towel and cut myself off from everyone. There’s a danger in being open and vulnerable to hear the word of God. The enemy is waiting for any way to get in and twist things around. When I’m at my most vulnerable, it is too easy to begin to doubt and to listen to the negative self-talk I’m so good at. I’m trying to squelch the negative chatter. I have wonderful friends that remind me that I am valuable and loved. I continue to struggle with self-doubt. I know that God is in control of everything. He can use me wherever He needs me. So, I continue to pray daily for His direction and guidance. I’m not going to quit going to conferences. But, I am going to work on accepting the teaching and encouragement I receive to stand strong and move forward. I’m a widow. This is my confession. I don’t want to go to restaurants alone. It’s almost like I have a sign on my forehead that says “She’s all by herself.” I have done it, but I feel like I’m wasting valuable space. Sometimes, I get take out and eat it in my car. In my driveway. I just don’t want to go into an empty house and eat alone. Cheese and crackers are just fine for lunch and dinner and even breakfast. Chips and dip or Raisin Bran are also acceptable. I sleep in my recliner most nights. I hate crawling into my bed all by myself. Too many memories. I keep the TV on 24 hours a day. It keeps me company, and it muffles the outside noises. It helps make the house feel less empty, a little less lonely. I talk to the TV. And the dogs. And myself. A LOT! When I’m all by myself and I don’t have to get up and get dressed, I don’t. I’ve spent entire weekends sleeping just because I don’t want to get out. I buy Peeps marshmallow chicks and bunnies every spring. Sometimes I get a box in every color. I don’t like Peeps. Terry did. Seeing couples around my age holding hands and just enjoying time together still makes me cry and a little jealous. I still get mad at my husband and yell at him on occasion. I don’t think I forgiven him for dying, yet. I still miss the other half of my couple. Your smile and your laugh. Falling into your arms for a reassuring embrace when things aren’t going that well. Knowing that there’s always someone on my side, even if I’m wrong. Feeling beautiful and loved just because you say so. Unplanned date nights, just because. Snuggling on the sofa watching television with you thee to tell me what I missed when I fall asleep. Late night talks and dreaming and planning and wondering what tomorrow will bring. I have become accustomed to missing all of theses things on most days. But not today. Today my heart hurts and my tears flow freely. And the ache feels fresh and new. I will count my blessings. I will look to tomorrow and dream of what is to come. But today, there are things that I miss. A close friend asked me this weekend if Valentine’s Day was any easier eight years after losing my husband. Without much thought, I answered “No.” After some thought, I think I will amend or at least explain my answer. Valentine’s Day (although very commercial) is the day we celebrate love. In my ideal world, it’s the day of hand-written notes and super gooey expressions of love. It’s an excuse to go all out to tell someone that they’re special and loved. 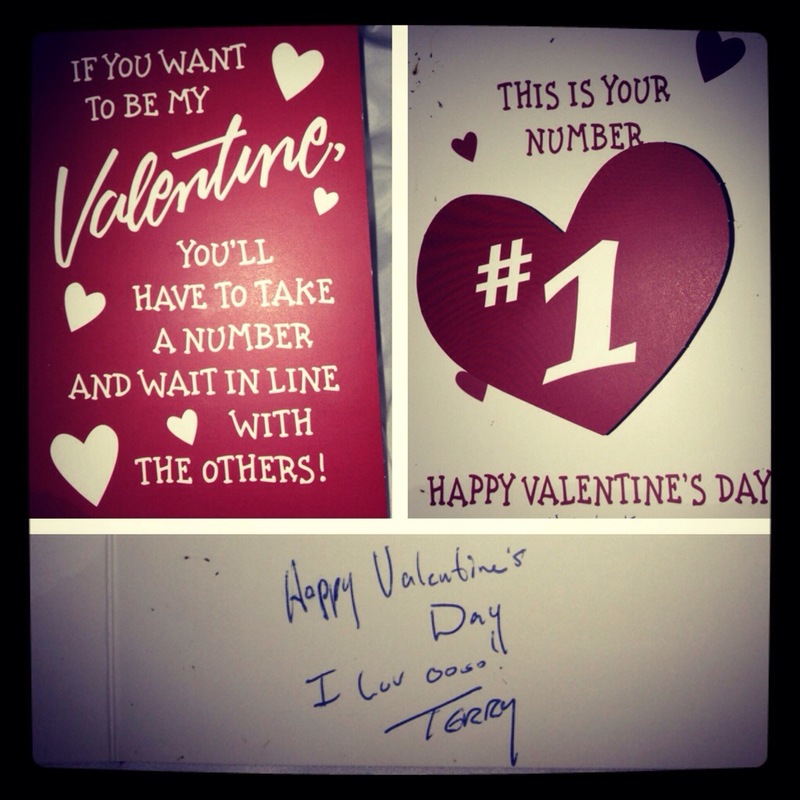 Now, Terry was not a super romantic. He tried, and he had his moments, but it was work for him. He was under the (mistaken) impression that one box of cheap candy from Wal-greens was enough for the whole family on Valentine’s Day. He did find ways to make it a day of special remembrances. I still have the last Valentine’s card he gave me. It’s silly and I cherish it. The first few years after Terry died, I HATED February 14. It was a reminder of everything I had lost, the life that was stolen from me. Terry made me laugh and cry. He made me angry and helped me to calm down. He loved me deeply and completely. 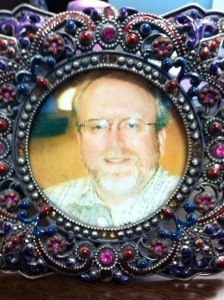 He was my confidante and my co-conspirator. He was always there, always ready. We shared our biggest dreams, our deepest fears, our greatest hopes. How do I “get over” losing that one person that was such a huge part of my world? I never will. This year, eight years later, I don’t say that “I Hate” February 14. The day is not as crippling to me as it has been in the past. But, I still mourn what I’ve lost. I confess that I look around at the roses being delivered to the office and I am envious. I miss being special and having a special someone to shower with love and silly gifts and cards. I would like to have one of those special Valentine’s Day dinners with someone other than one of my kids. I wonder as I look at couples if they really understand how wonderful it is to be a couple. Do they just take it all for granted? So, my answer is remains “No.” I close my eyes and try to return to those days when I was cherished. I try to remember feeling safe and loved and special. I give thanks for the love I did know. And, on those dark days that still overtake me on occasion, I ask “Why?” No, it’s not any easier after eight years. Tonight I was the entertainment at a Valentine’s Party. I was asked to do about an hour and a half of romantic music. It’s been over twenty years since I’ve done this kind of music. Did I tell you I was asked on Wednesday evening? I has to find music that I could play and sing. That’s no easy task in today’s world. You can’t just walk into a music store and find a huge selection of piano music. And love songs are even harder to find. But, I did find some show tunes and several wedding books of love songs that would work. I was the only ‘single’ person there. As I sang “When I Fall in Love,” I wondered if these couples realized how blessed they are to have each other. Thoughts of those first days of marriage flew through my mind during “We’ve Only Just Begun.” And I silently thanked God for the love I had when I sang “Keeper of the Stars.” I just wish I had told Terry that more often. I try to avoid Valentines Day in most cases. It’s too easy to focus on what is missing instead of the true blessing I was given. I had 18 years with a man that thought I was beautiful and loved me deeply. Tonight, I remembered. Some have known great love in life. This day is bittersweet. A time of cherished memories. Some enjoy great love now. This day is a day to celebrate that blessing. Some look forward to a great love. This is a day for joy and anticipation. Let us all take the opportunity to show love to those God places into our paths on this day. Now our knowledge is partial and incomplete, and even the gift of prophecy reveals only part of the whole picture! But when the time of perfection comes, these partial things will become useless.